We were very unorganized before, but we've made amazing progress for environmental models these last few months. I just wanted to repost this with all the new volunteers coming in, in case we need some more direction. I’ll cut right to the chase, because no one wants to read a wall of text. I need some assets. Being the lead landscape designer, I am posting an organized list of assets I need made by our 3D artists. I don’t want to sound like a demanding jerk, but this has to happen if we want to get the world done. There needs to be some prioritizing and organizing here. I don’t need many new assets for each area, since the main Skyrim ones are more than enough. Comments and suggestions are welcomed, but let’s coordinate and see what we can do. I want to tackle each area one at a time, so the most helpful thing to do in this case is have everyone focus on one region at the same time, OR have one specific artist work on one area so things are consistent and organized. Please talk to ErikChristensen or Ravanna before you start working. Show them some previous work so they can evaluate your skill level and better decide where you can be most helpful. Also, be sure you can FINISH the assets you claim, and if not, hand the work off to someone else. We want to keep this organized. Be aware that this list will be updated as we tackle and area and the need for addition assets will come up, as well as new concepts made. These are the general status for each area. I want to tackle/polish the regions in this order. 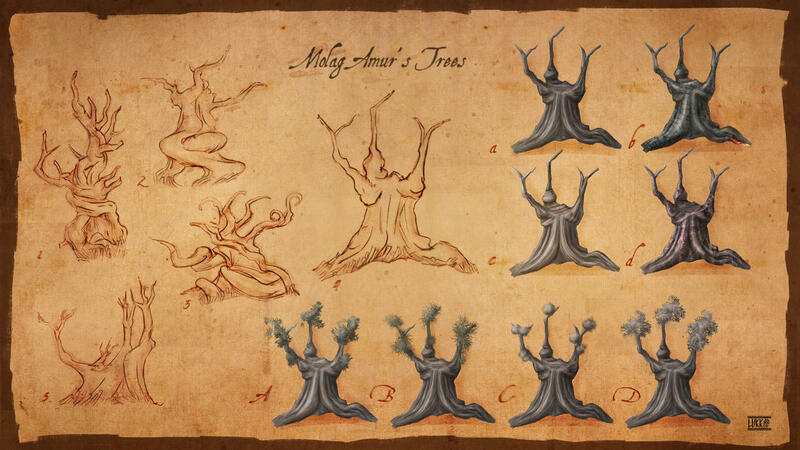 Ascadian Isles - I know some corkbulb trees were in the works, but I don’t need any more assets for this area. It’s just a matter of polishing it up once Vivec and Ebonheart get their overhauls. No assets needed here unless I think of some more. On hold for now. Azura’s Coast - I have basalts coming out my ears . We need FLORA. The originals need to be redone or make an alternative using concepts (I’ll post down below what I need specifically). Molag Amur - Luckily for us, this area is mountainous. I have already made heavy use of Skyrim’s pieces and it works for now. This area is largely done and just needs a few more assets (dead shrubs, etc, i’ll post below). Being my first area, it needs a facelift and it’s hard to say when it can get done. I’m thinking none of the original Morrowind assets for this area that aren’t already made, don’t have to be. They can all be replaced with Skyrim objects. Ashlands - Northern region is shaping up well. We got a handful of assets for this area already. eloth is working on it currently, so if he needs assets made, he'll ask. Grazelands - This area is small comparably, but I am unsure what the plan for this area is. I know there have been several concepts in the works. But for now, no 3D or landscape work is being done for this region (that I know of). Red Mountain - The heightmap is mostly done and being finalized. This area is being planned and no assets are in the works yet. I imagine it can also make heavy use of Skyrim's assets. Sheogorad - The slate assets are finished aside from some texture issues. All this area still needs is flora and a few other things. Details below. Solstheim - No, just, no. This area uses Skyrim/Dragonborn assets anyways. When we DO get around to the DLCs, this will just need remade Skaal and quest items. Hopefully you get a general idea for each area. Using these concepts, I need very specific assets made. This list can and will be updated periodically. Pick a claim, coordinate, and keep us updated! If all artists decide to tackle one area at a time, this is the order to do it. Dooooone. Doesn't that feel good? Nothing to see here folks. This area is largely complete already. I know a few Cork bulb trees were in the works, so if those are finished, send them my way. Other than that, small plants are shrubs in this area need to be done. I know the generic "MWGrass" still needs to be redone. Rocks and trees are finished or being tweaked. Don't worry about remaking the rocks for this area, they are being removed for now. 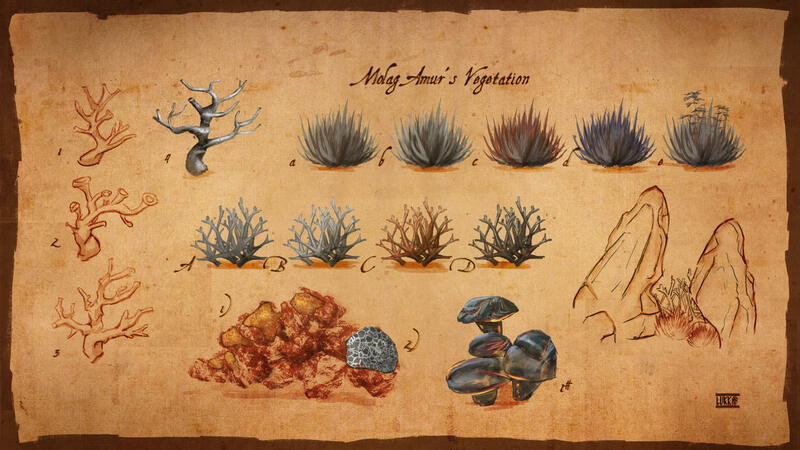 What we need are the unique trees/shrubs for this region remade. There is no list or references at the moment. I don't need much, I have the concepts. A few shrubs and mole crab nests need to be done. I need huge island pillar/menhirs circled here. - Menhirs/pillars. Huge, climbable, a few variants, the tops should be able to be cluttered and landscaped. Again, this area is largely done with Skyrim assets. What it IS missing is vegetation. It's too empty and boring without them. - trees. I know these are being worked on right now. Again, shrubs. This area can even share some with Molag Amur. The northern area is mostly done and looks fine using the assets we already have. At the same time, there aren't a lot of concepts for this area. For now, no need for new assets. The pillar rocks and original plants are mostly remade already. I will update this as I learn what I need. Many of these are already in the works. Just keep doing what you're doing! - Trees for days. 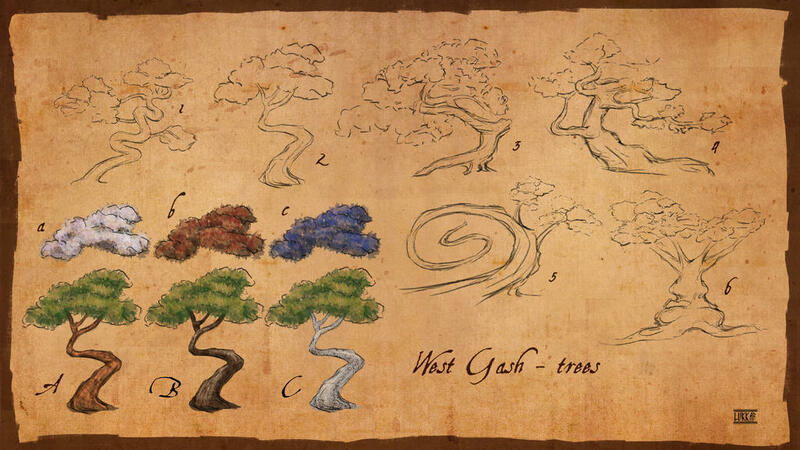 Basically all the trees in these concepts. With the already made rocks and plants, this area is solid. I can't say what I need here yet. Will have to wait for more concepts. Nothing can be done here yet. Waiting to sort out ideas and concepts. Shrubs and plants. The slate rocks need some tweaking at some point. These shrubs are perfect. More moss and small plants will help break up this rocky area as well. Again, assets are being made. We don't need these plants made until everything else listed above is done. More information to come. We have bit off more than we can chew here. The world is huge and way too much work for me and a few other people to do on our own. New landscapers are rare and it’s going to be a huge task. But with these assets, we’re going to work like hell to finish the world. The assets are slowly but surely coming and we've made HUGE progress in this area in the last few months. Updates to come. Check back often. For now, let's have an open discussion, coordinate, make claims, and get crackin'. I hope none of this adds too much to the work load, and really, I am not asking for much. Just these small areas will compliment Skyrim's assets to give each area a more unique feel. The landscape team will make good use of what you made us, as long as it's done right. Hopefully these instructions are clear. If you have further questions, consult Ravanna or ErikChristensen about modeling assignments. The trees are being done already, but small plants and shrubs are open to do. Again, check with Ravanna first. He knows your skills and strengths. Finally got around to it. Finally got around to it. This will for sure help with planning out areas. hang on Squally, the Sheo rock assets 2nd batch are nearly done. That means I can start almost now, so why aren't those a higher priority. They'll get finished and delivered to you, don't worry. They're coming. 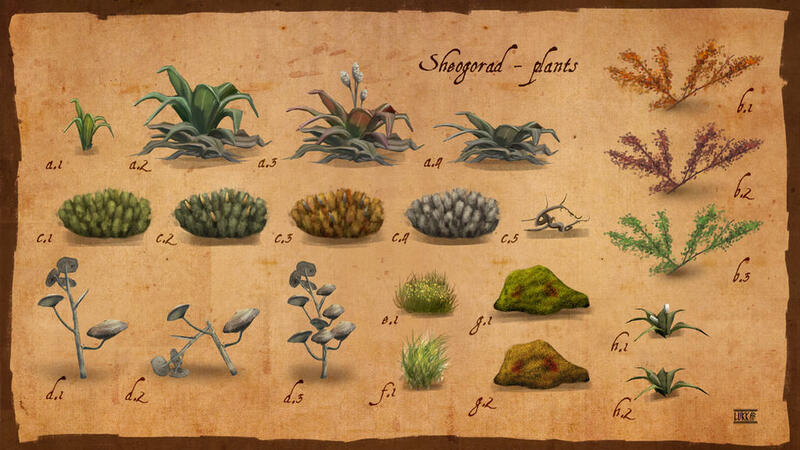 Grazelands plant concept is great. Who are making it? Who ever claims it when we start Grazelands. Maybe i will try smth alike. Maybe i will try smth alike. But not 100% this. I'm not sure how many 3D artists we have and what they are working on, but it's been quite a few days and there haven't been any claims made here really. I really want to stress the importance of this. The landscapers need these assets so we can start putting the world together, which is an incredibly enormous task. While we do that, THAT is when you have time to work on armors and other things. We don't want to be put on delay waiting for this stuff, might as well have 2 groups working at once. As important as it is though, I also don't want anyone stressing (looking at you Ravanna). This is indeed a priority, but there is plenty to do with what we have. Just manage your time and talents and let's get to work. Here's the lowdown on everything i'm working on, or i know others are working on, environment wise. Me: Rocks, cliffs, stones. Draggle. Maybe Stalactites with scump. Bitter Oak trees waiting for Zoph. Scump: we all know what that guy is streaming through work wise, flora mostly. Felix: going to get him to do some unique entrances including tomb. I need the current set of BC textures and combine them with the new rock/bark textures eloth and I were doing. there will be another 2 batches for this area. 1+2 are for western sheo major assets for 1st pass. 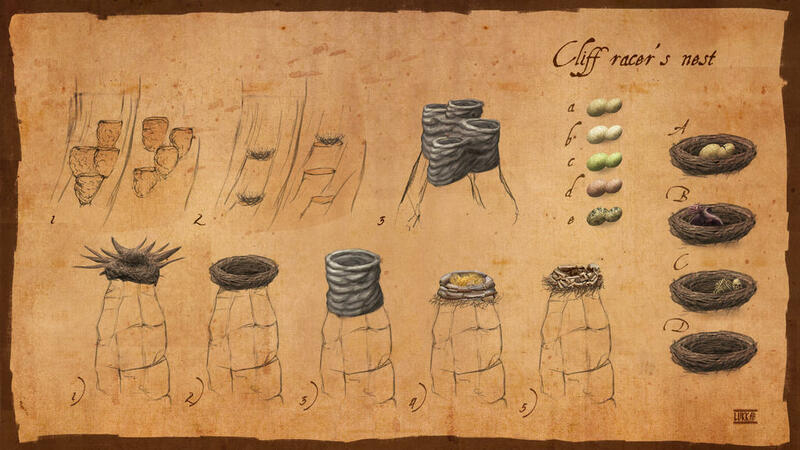 Azura: Zafirel: I have a new artist who wants to learn how to do rocks, will require skype tutorials. "Uninter"
As you can you can see you get the whole of ash mountain, looks near complete, not populated, but has *some* effects.. the terrain *all* has collision.. there is a second part is a large section across the water I don't know what that is. Kindly, hoping to share and make you guys aware on the off chance you didn't know. EDIT: here's a better link to the screenshots. Here a first plant ready to go. Hope you like it. By the way if anyone could give me an idea about how big those plants are it would be nice. Since I've got no reference how to scale it except trees on the right. I want to say about mid-shin height. Nothing too big. It can always be scaled up or down a bit in the Creation Kit as well. Nice work though! You planning on doing any more? It's much better to have a big model and scale down then having a small one and scaling up. that way textures are preserved. Better to make model the biggest it will ever be in the game or bigger then middle scale. Thanks for quick reply Squally. Of course it can be scaled later on. It was just about a choice of a good method, so I don’t abuse using simple doublesided planes. I got it, important that it looks good no matter scales. And yes, I have the intention to keep going.